Thank you for your kind comments about Les. It is very comforting to know that he was well liked. We were very close and he helped me in any way he could and I also supported him especially throughout his illness. 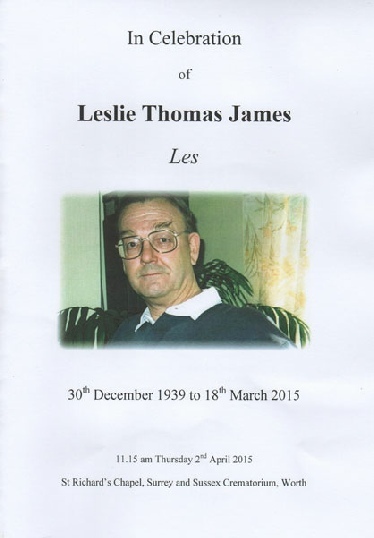 I have attached the front of the Order of Service which has a very nice photo of Les. I honoured his cheeky sense of humour and we all left the funeral service to The Ying Tong Song by The Goons which was one of his favourites, and he could do all the voices. The result was that everyone came out smiling, which was my aim. Best wishes to you and the rest of the 84th.